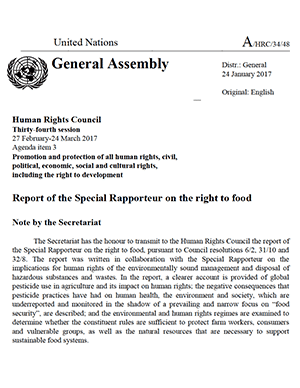 The present report of the Special Rapporteur on the right to food was written in collaboration with the Special Rapporteur on the implications for human rights of the environmentally sound management and disposal of hazardous substances and wastes. Pesticides, which have been aggressively promoted, are a global human rights concern, and their use can have very detrimental consequences on the enjoyment of the right to food. Defined as any substance or mixture of substances of chemical and biological ingredients intended to repel, destroy or control any pest or regulate plant growth, pesticides are responsible for an estimated 200,000 acute poisoning deaths each year, 99 per cent of which occur in developing countries, where health, safety and environmental regulations are weaker and less strictly applied. While records on global pesticide use are incomplete, it is generally agreed that application rates have increased dramatically over the past few decades.